| Bigg news, Bigg news, events, contests and more! Bigg news, Bigg news, events, contests and more! I am exited to announce that we are teaming up with Anthony Traina School in Northern California for a book fair, reading and signing of Mr. Biggs in the City. The event will be held at Barnes and Noble in Tracy, Ca. 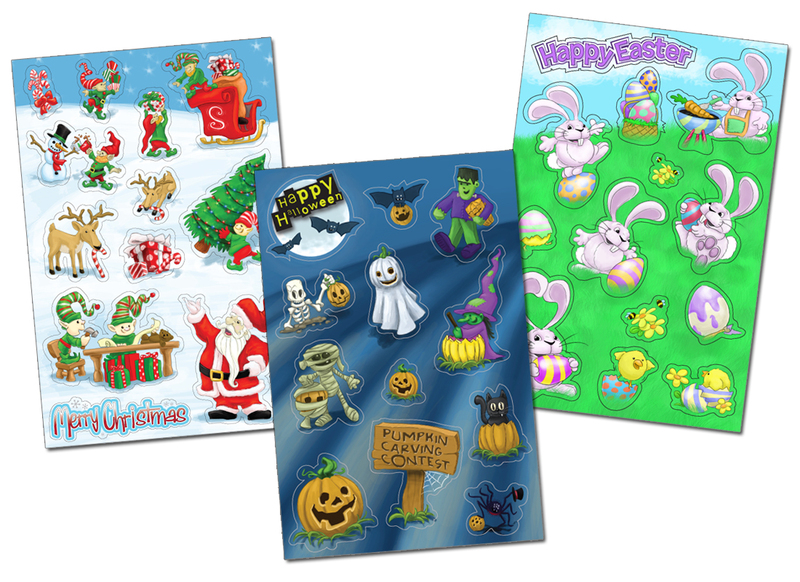 I just finished a few illustrations that will be used on sticker sheets. I love working on projects like this because they usually have only a few rules and give me free reign to just create fun art. I’m eager tos start the illustrations for my new book series Farm Files. I recently finished the text and am searching for the right publisher. I hope to have more news on this soon. Book 2 – Mr. Biggs at the Circus is set to hit the shelves in May of 2012 and can be pre-ordered on Amazon.com. 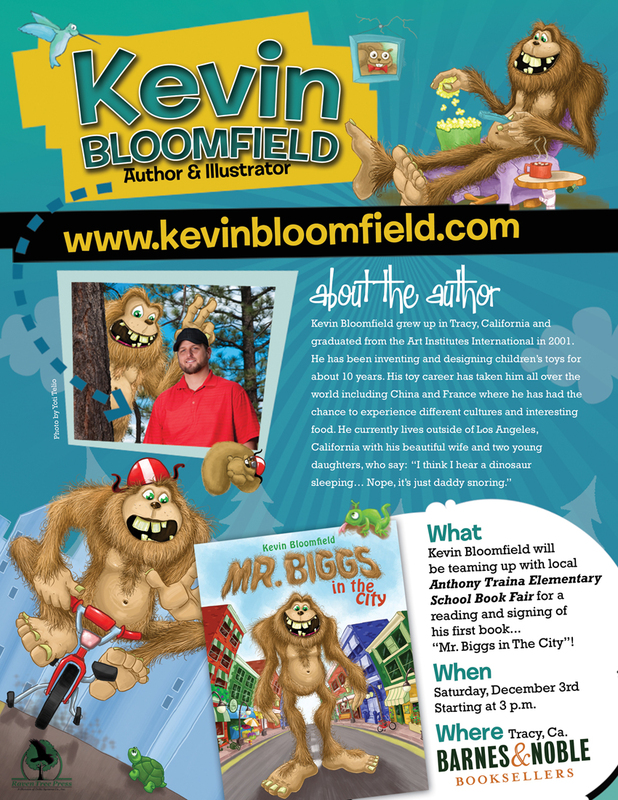 http://www.amazon.com/Mr-Biggs-Circus-Kevin-Bloomfield/dp/1936299992 It’s available in both English and English/Spanish text. Mr. Biggs Tutor-Time Preschool event! 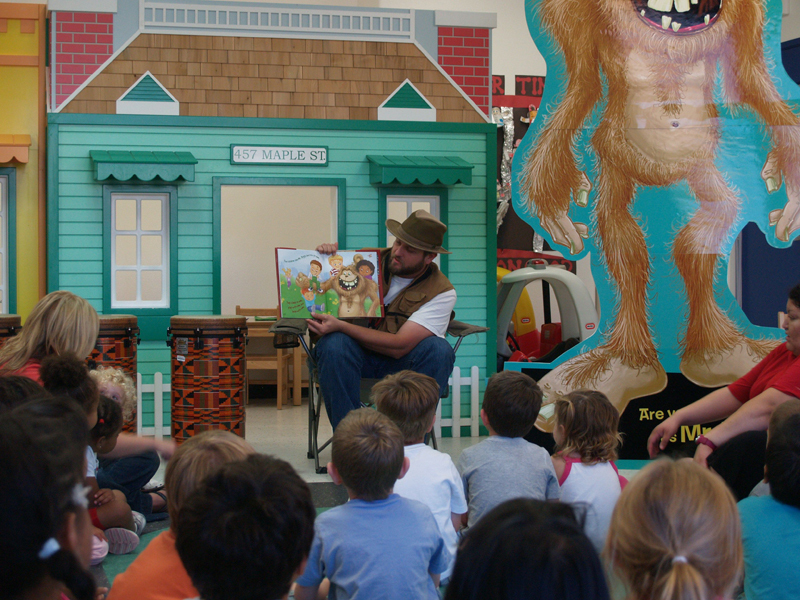 I was asked if I was interested in doing a reading of Mr. Biggs at Tutor Time learning centers (preschool) outside of LA and I jumped at the chance. There is no better feeling then seeing a room full of happy children listening, and participating in a Mr. Biggs adventure. For this event I teamed up with Roxanne Jeppesen and her non-profit Cultivating Creative Minds (http://cultivatingcreativeminds.com/). 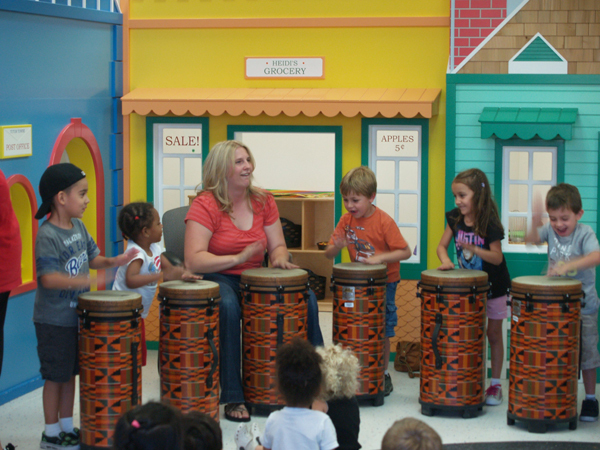 She brought a handful of large hand drums and with her enthusiasm managed to get a room full of 3 to 6 year olds in rhythm… all except me. I couldn’t keep up. The reading went great. We asked questions throughout the reading and rewarded the kids answers with a chance to play the drum to the rest of the class. After the reading the kids had the chance to compare their foot size to Mr. Biggs giant footsteps. All in all a great event. Thank you to Tutor Time (http://www.tutortime.com/) for letting us share Mr. Biggs! This Bigg Blog post is coming a little late. We’re still figuring out this digital media thing.. I was asked by my publisher, Raven Tree Press, to fly down to New York for Book Expo America (BEA) and help launch Mr. Biggs in the City to the trade. BEA is the largest publishing event in North America. It’s mostly for the trade and gives a sneak peek to what’s new, what’s next and everything exciting in the world of books. My wife Kelly and I decided to turn it into a 5 day working vacation, with not too much working… and without the kids! We had never been to New York and little did we know that it’s impossible to “Do” New York in 5 days, but we sure tried. Day 1 – We landed at JFK and made our way into Manhattan on a crazy Taxi ride. We had just enough time to put on our walking shoes and head out to meet our friends for dinner. To my delight it was MEATBALL MONDAYS at this great little restaruant called UVA. Day 2 – We started with a bus ride and jumped on a ferry to Ellis island and The Statue of Liberty. She’s pretty amazing up close. I had no idea how much detail was in her dress. Once back to the shore we made our way by foot through Wall Street where we took some funny pics with the famous bull. It was pretty crowded in the front so we took our pics from the back -Ha Ha. From there we made our way over to the Bodies Exhibit. This is a neat show and I highly recommend it to all artist. We jumped on another quick bus over to Little Italy and started to walk where we quickly got lost in the mix of twisty little streets. We walked all the way to The Empire State Building and after standing in line for over an hour we got a quick glimpse of the view. The view is amazing but it was way too crowded to enjoy it. Day 3 – My wife really wanted to get on the Today Show so we woke up way too early in the morning and stood shoulder to shoulder with a bunch of other tourist trying to squeeze our faces into frame. Turns out we were in the right place and succeeded in making the worst crazy tourist faces possible. After making fools of ourselves on national television we headed off to the Javitz Center for BEA2011. I didn’t know what to expect as it’s my first book, but it was a great success. As we were prepping all the books to sign the line started to pile up. 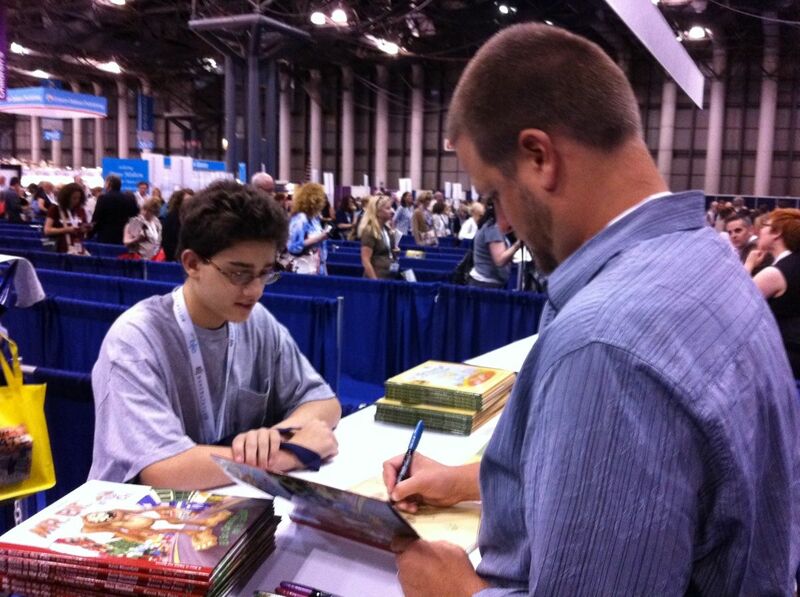 It was great to meet some librarians and teachers. They all seemed very nice and had a lot of great things to say about Mr. Biggs in the City. 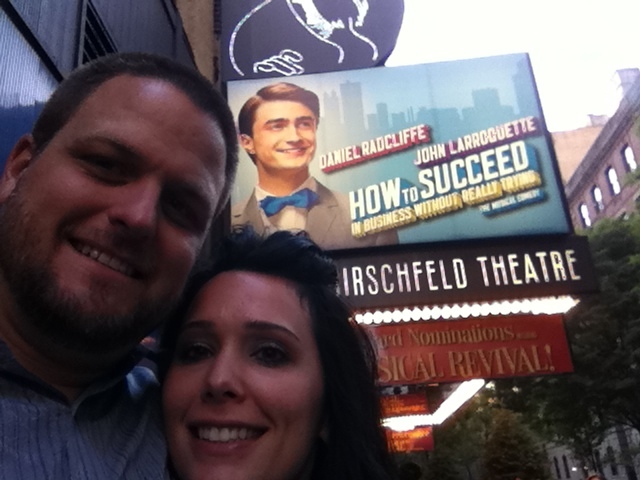 That night we celebrated by purchasing tickets to see Harry Potters Daniel Radcliff in How To Succeed In Business Without Really Trying. I was surprised by how much I liked this show. It was hilarious and Radcliff was great. It was a long day but we ended it with a bang! We found a place called Holy Cow! Picture this, soft donut split in half and dipped in chocolate. Add 3 scoops of home-made ice cream and top with just about anything you can imagine. It’s a good thing they don’t have this place near our house. 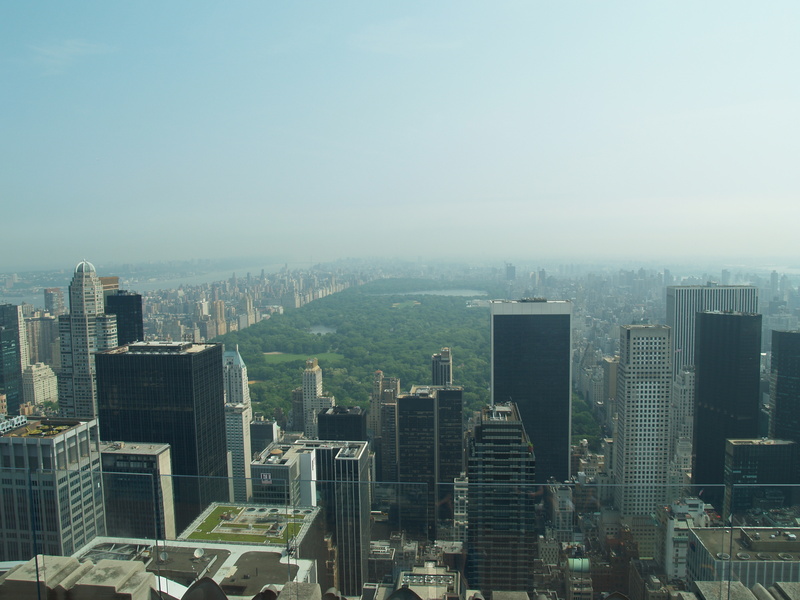 Day 4 – We started with the NBC studio tour and headed up to the top of the Rock! The Rock was so much better than the Empire State Building. The views were amazing and the crowds were much smaller. After exploring for a while we headed off to see the show Chicago. Kelly had the hook-ups and got us back stage. It wasn’t what I expected at all. Low ceilings, old brick walls and lot’s of exposed wires. Everyone one was nice and Kelly got her moment on stage! Day 5 – Short day today.. We walked down the street and took a great bike tour through Central Park. It was a beautiful day and it was nice to pretend we weren’t in a huge city. After our park ride we rushed back to the hotel and off to the airport. 5 days truly wasn’t long enough. I can’t wait to go back. The people were nice, the city was fun and the food was delicious.